Yesterday when I wrote about this ultra-realistic new short hairstyle at Moxxi, I knew it would be the perfect style for modern girl-geek look. Short, messy, and a little bit edgy, it was just a pair of glasses and a modest skin away from being the belle of the convention center. Something simple but not plain, pretty but not glamorous, distinct but not distracting. I found that perfect skin at Adam n Eve, among the array of skins released recently during their shop expansion in Caledonia (Blink teleport here). I picked Clover, a skin spattered with freckles. Adam n Eve skins are designed to suit the default female shape, but they look phenomenal on purchased shapes as well, which I usually wear myself. Clover is a very charming skin with matte, natural lips and red brows. Though it's technically a redhead skin, don't forget that it's easy enough to tint your eyebrows using a cosmetics layer (which you can learn about here). Speaking of cosmetics layers, I know some of you might be asking why I'm bothering with a freckled ginger skin if I can give myself freckles on a cosmetics layer. While cosmetics layers are versatile, they're not unlimited. You can only put cosmetics layers on your face and neck, leaving the rest of your avatar's body unchanged. If you really want to commit to a freckled avatar, getting a fully freckled skin like Clover means that you can have those cute little spots of melanin over more than just your face. 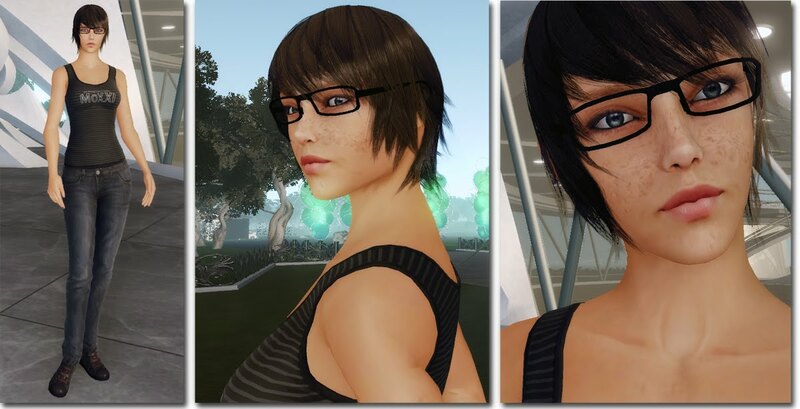 Clover is the perfect skin for my geeky girl avatar look, but how would you wear it? As always, leave a comment or email me!